DayCare develops all its products thinking of the well-being of its consumers. The formulas, created from scratch, have rich and perfumed textures, providing cosmetic benefits while awakening the senses. DayCare wishes to contribute to your health, beauty and well-being. Understand your first layer of protection. The heaviest organ in the human body, the skin represents 15% of our body weight and covers an area of 12 to 20m2. Skin comprises 70% water, 25% proteins and less than 5% fats and its main role is to protect the body, organs and bones from external aggression. Besides being an effective barrier against viruses and bacteria, the skin also has an important sensorial role, enabling us to feel cold, heat and textures. The skin is essentially made up of three types. Nails: nails are made of keratin which forms hardened plates that protect the ends of fingers and toes. Hairs: these are present over almost all the cutaneous area, except the palms of the hands and soles of the feet. The scalp is where most hair is concentrated, specifically between 100 to 150 thousand hairs with a highly effective cycle of renewal, since every day between 70 and 100 hairs are lost. Sweat glands: these are responsible for sweat and are of great importance in regulating body temperature. These glands are of two types: eccrine glands, which are found in larger numbers all over the body and produce sweat eliminating it directly on the skin; and apocrine glands, which are more localised (armpits, pubis, genital area …) and fewer in number and are responsible for body odour, as a result of the sweat produced. 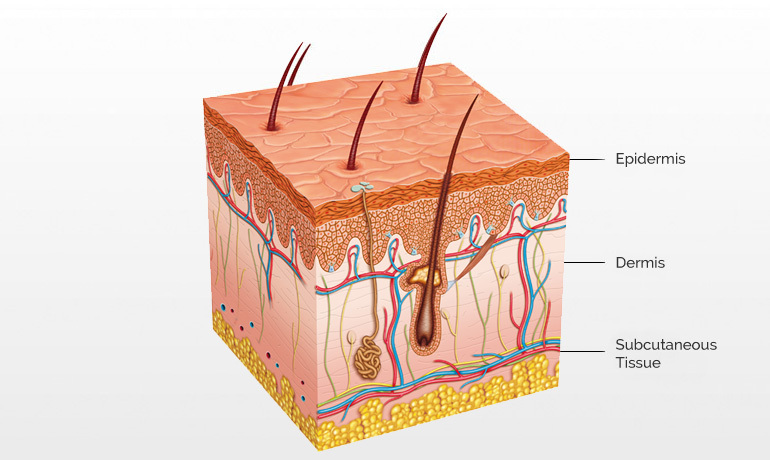 Sebaceous glands: these glands produce oiliness or sebum which is present on almost all skin, particularly on the face, scalp and upper part of the torso. This is the thickest layer of skin. The dermis consists of fibroblasts that produce collagen and elastin, proteins that give strength to the dermis, small blood vessels that feed the skin and lymph nodes that protect the skin from toxins. This is the deepest layer of the skin and mainly comprises fat. Its main purpose is to cushion and to insulate warmth in the body. Normal skin: with a fine texture, a soft and smooth and very flexible surface. This is the most well-balanced skin type and that which normally presents less problems and imperfections. For effective cleansing, use neutral soaps and moisturising creams for normal skins, without oils. Oily skin: shinier due to the excess sebum produced, with dilated and darker pores due to accumulated impurities, this skin has a greater tendency for spots. Dry skin: with a dull appearance, this is the skin that requires more care, since it ages faster due to its lack of elasticity and tendency to flake. Use products without alcohol and moisturising creams with a light and smooth texture, preferably with sweet almond oil. 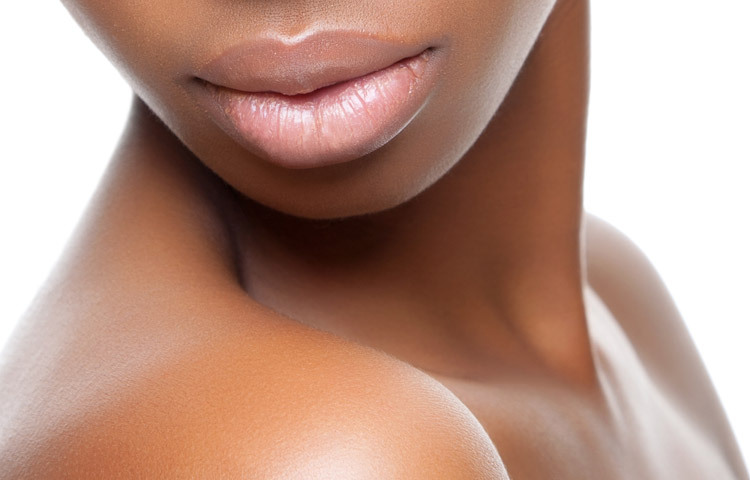 Mixed skin: this is the most common skin type and is a combination of dry and oily skin. It normally has a T zone (chin, nose and forehead), which is more oily with more dilated pores, while the area of the eyes, mouth and cheeks is drier. Sensitive skin: this is the most fragile skin and is easily irritated or inflamed. For this reason, blemishes, stinging and flaking are common in this type of skin and it is therefore the skin that requires most special care. Use products specifically for sensitive skin. The skin is vital for the proper functioning of the body, and through constant and visible changes, the skin shows us how it is indeed functioning. So, what really happens with the skin? It perspires: although it is sometimes disagreeable and inconvenient, perspiration is a way of detoxifying the body and burning fats. Perspiration cools the body and also increases blood flow, which releases toxins and cleanses the body. It tans and burns: exposure to the sun causes a protective reaction in skin, stimulating melanocytes (cells that protect the skin from excess sun) to produce the pigment that protects from the sun – melanin. But this process is slow and takes several days, which means that going to the beach without sunscreen and with a low level of melanin can have adverse consequences for the skin, such as allergies, cancer and tumours. For this reason, never forget a good sunscreen and sun hat and avoid times with greater sun exposure, from 12.00 to 16.00. It wrinkles: wrinkles are one of the body’s main indicators of ageing, especially the vertical lines above the lips and between the eyes. Each of these changes has different causes, such as tobacco smoke, the inflammation of blood vessels or an accumulation of stress. Wrinkles are the result of movements of facial muscles that can create deep folds over time and when frequently used. The repeated flexion of muscles creates an inflammation and collagen is compressed. Young skin can react and stretch, but as we age the bonds between the skin and the underlying connective tissue are stretched, which can cause flaccid skin and it starts to sag: the result is the formation of wrinkles. Here are some tips on how to keep your skin healthy and nourished. 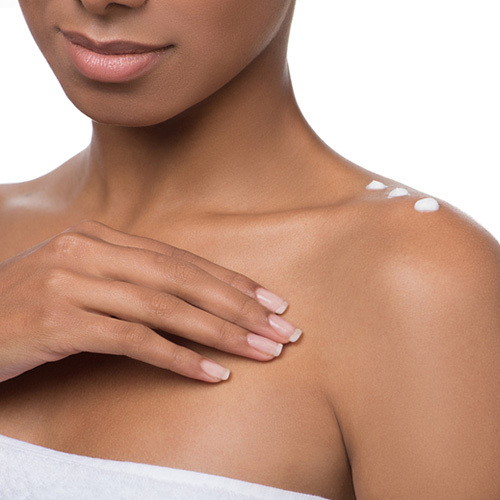 Moisturise it: the list of ingredients that can really make a difference is quite short: vitamins A, B3, B5, C and E. Remember these ingredients when you choose a lotion or body cream. And don’t forget to use a good sunscreen. Even if you’re not going to the beach, it is essential to use a cream or lotion with UV protection. A healthy diet: choose food rich in biotins, such as eggs, vegetables, avocados, soy beans and nuts, which are excellent to prevent dry skin. Eat plenty of salmon! It contains astaxanthin, which helps to improve the elasticity of skin, as well as Omega 3, a good fat that rejuvenates your skin. Among fruit, choose pomegranate, which can thicken the epidermis and prolong the life of the fibroblasts that produce collagen and elastin. Drink green tea, perfect against the lesions caused by sun. Finally, completely eliminate alcohol from your diet, since it dehydrates the skin. Sleep well: sleep is essential to stimulate the hormone responsible for the health of fibroblasts and encourage the production of collagen and elastin to maintain a healthy skin. An adult has on average 3 million strands of hair that grow 1 cm each month. What distinguishes head hair from the other hair on our body is its concentration on the skull and its length. Straight, frizzy, wavy, blond, black, brown, red, whatever its texture and colour, hair is much more than just an aesthetic feature, since it is a thermal protector for the skull, protecting the head from radiation. It is often also the first indicator of changes in the human body, acting as a warning sign of illnesses. To understand what you can do to improve the appearance of your hair, it is essential to understand its structure, how it is born, how it grows and dies. Each strand of hair has its own blood supply, which means that your diet and health are directly responsible for the well-being of your hair. Medulla: located in the centre of the strand, the medulla comprises blood and oxygen and is the only part of the strand that is in contact with the bulb, the hair’s living cell. Cortex: the cortex represents 90% of the strand and consists of keratin. Strength, resistance and vitality are some of the duties of the cortex. 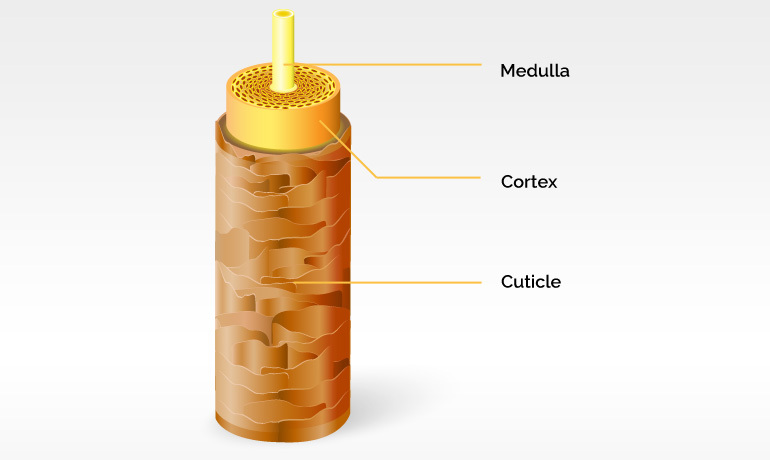 Cuticle: this is the outer layer of the strand of hair, comprising keratin cells that overlap each other and are intended to protect the hair fibre. The cuticle is entirely transparent and colourless and is also responsible for the shine of hair; in other words, when its cells neatly overlap, light is much more easily reflected. Each strand is a shaft formed by melanin and keratin, responsible for the flexibility and strength of the hair. 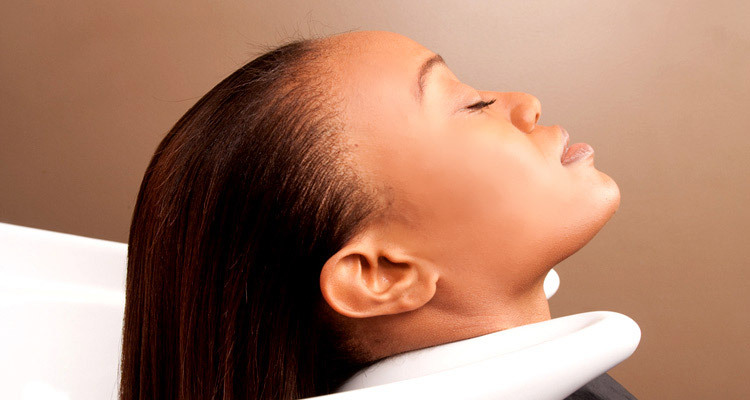 Keratin is produced in the epidermis, from amino acids, vitamins and mineral salts. It is therefore essential to have a healthy diet rich in nutrients to help the production of keratin. Melanin is responsible for hair colour. It is a protein that can be of two types: eumelanin, which is responsible for darker shades, from brown to black, and pheomelanin, which results almost exclusively in red hair. A mixture of the two types results in light brown, blond and intermediate coloured hair. You can blame genetics for the amount of white hair and the age it starts to appear. But the fact is that this process is inevitable. Sooner or later, cells produce less melanin along their natural length and white hair starts to appear. So, white hair does not represent damage, but instead natural changes at a cell level. Although genetics are responsible for a tendency for baldness, age and levels of androgens (male hormones) are also contributing factors for hair loss. 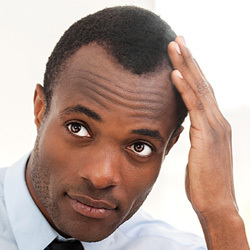 In the case of men, studies have revealed that high levels of dihydrotestosterone or DHT (from the metabolism of testosterone) weaken hair follicles, leading to short and fine hair. For women, these causes are joined by factors such as low levels of iron, anaemia, pregnancy, the post-partum period, autoimmune diseases such as lupus and thyroid diseases. Step 1: Wash. Before showering, comb you hair gently to free it from tangles and dirt. Always use an appropriate shampoo for your hair type. Wash your hair with gentle movements so that you don’t damage the hair and take the opportunity to gently massage your scalp. Don’t put all the shampoo on the top of your head; make sure it is always spread down to the tips. Rinse well to avoid leaving residue on your hair. Step 3: Dry. Wet hair is very delicate and breaks easily. For this reason, dry it gently with a towel. Then use a wooden comb with wide and rounded teeth to comb out any tangles. Or if you prefer, use your fingers for your curls to look as natural as possible. Never backcomb your hair as this can tear the cuticle scales and expose the internal cortex. Finally, finish using a dryer at the lowest temperature possible.